1 A None No Power Seat 1 A is a recliner Business class seat which may have extra legroom due to the bulkhead wall position. Proximity to the galley may be bothersome. There is no floor storage during takeoff and landing. The tray table is located in the armrest, making the armrest immovable and slightly reducing seat width. 1 C None No Power Seat 1 C is a recliner Business class seat which may have extra legroom due to the bulkhead wall position. Proximity to the galley may be bothersome. There is no floor storage during takeoff and landing. The tray table is located in the armrest, making the armrest immovable and slightly reducing seat width. 1 H None No Power Seat 1 H is a recliner Business class seat which may have extra legroom due to the bulkhead wall position. Proximity to the galley may be bothersome. There is no floor storage during takeoff and landing. The tray table is located in the armrest, making the armrest immovable and slightly reducing seat width. 1 K None No Power Seat 1 K is a recliner Business class seat which may have extra legroom due to the bulkhead wall position. Proximity to the galley may be bothersome. There is no floor storage during takeoff and landing. The tray table is located in the armrest, making the armrest immovable and slightly reducing seat width. 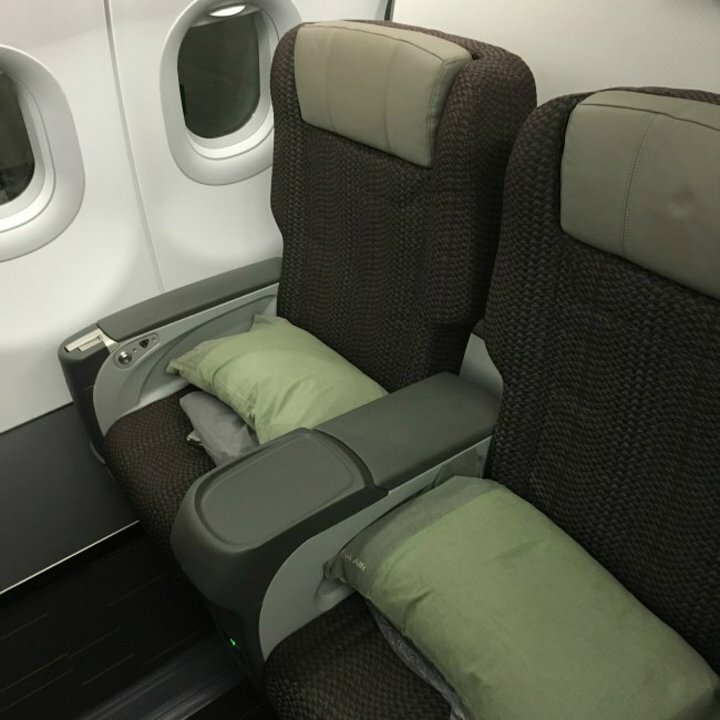 2 A None No Power Seat 2 A is a standard recliner Business Class seat. 2 C None No Power Seat 2 C is a standard recliner Business Class seat. 2 H None No Power Seat 2 H is a standard recliner Business Class seat. 2 K None No Power Seat 2 K is a standard recliner Business Class seat. 20 A None No Power Seat 20 A has extra legroom due to the position of the bulkhead wall. There is no floor storage during takeoff and landing. The tray table is located in the armrest, making the armrest immovable and slightly reducing seat width. 20 B None No Power Seat 20 B has extra legroom due to the position of the bulkhead wall. There is no floor storage during takeoff and landing. The tray table is located in the armrest, making the armrest immovable and slightly reducing seat width. 20 C None No Power Seat 20 C has extra legroom due to the position of the bulkhead wall. There is no floor storage during takeoff and landing. The tray table is located in the armrest, making the armrest immovable and slightly reducing seat width. 20 H None No Power Seat 20 H has extra legroom due to the position of the bulkhead wall. There is no floor storage during takeoff and landing. The tray table is located in the armrest, making the armrest immovable and slightly reducing seat width. 20 J None No Power Seat 20 J has extra legroom due to the position of the bulkhead wall. There is no floor storage during takeoff and landing. The tray table is located in the armrest, making the armrest immovable and slightly reducing seat width. 20 K None No Power Seat 20 K has extra legroom due to the position of the bulkhead wall. There is no floor storage during takeoff and landing. The tray table is located in the armrest, making the armrest immovable and slightly reducing seat width. 25 A None No Power Seat 25 A does not recline due to the exit row behind. 25 C None No Power Seat 25 C does not recline due to the exit row behind. 25 H None No Power Seat 25 H does not recline due to the exit row behind. 25 K None No Power Seat 25 K does not recline due to the exit row behind. 26 A None No Power Seat 26 A has extra legroom due to the exit row. There is no floor storage during takeoff and landing. 26 B None No Power Seat 26 B has extra legroom due to the exit row. There is no floor storage during takeoff and landing. 26 C None No Power Seat 26 C has extra legroom due to the exit row. There is no floor storage during takeoff and landing. 26 H None No Power Seat 26 H has extra legroom due to the exit row. There is no floor storage during takeoff and landing. 26 J None No Power Seat 26 J has extra legroom due to the exit row. There is no floor storage during takeoff and landing. 26 K None No Power Seat 26 K has extra legroom due to the exit row. There is no floor storage during takeoff and landing. 36 A None No Power Seat 36 A may not recline due to the wall behind. proximity to the lavatories may be bothersome. 36 B None No Power Seat 36 B may not recline due to the wall behind. proximity to the lavatories may be bothersome. 36 C None No Power Seat 36 C may not recline due to the wall behind. proximity to the lavatories may be bothersome. 36 H None No Power Seat 36 H may not recline due to the wall behind. proximity to the lavatories may be bothersome. 36 J None No Power Seat 36 J may not recline due to the wall behind. proximity to the lavatories may be bothersome. 36 K None No Power Seat 36 K may not recline due to the wall behind. proximity to the lavatories may be bothersome. 37 A None No Power Seat 37 A has extra legroom due to the exit row, although close proximity to the lavatories may be bothersome. There is no floor storage during takeoff and landing. The tray table is located in the armrest, making the armrest immovable and slightly reducing seat width. 37 C None No Power Seat 37 C has extra legroom due to the exit row, although close proximity to the lavatories may be bothersome. There is no floor storage during takeoff and landing. The tray table is located in the armrest, making the armrest immovable and slightly reducing seat width. 37 H None No Power Seat 37 H has extra legroom due to the exit row, although close proximity to the lavatories may be bothersome. There is no floor storage during takeoff and landing. The tray table is located in the armrest, making the armrest immovable and slightly reducing seat width. 37 K None No Power Seat 37 K has extra legroom due to the exit row, although close proximity to the lavatories may be bothersome. There is no floor storage during takeoff and landing. The tray table is located in the armrest, making the armrest immovable and slightly reducing seat width. 38 A None No Power Seat 38 A has plenty of extra legroom due to a missing seat in the row ahead. There is no floor storage during takeoff and landing. The tray table is located in the armrest, making the armrest immovable and slightly reducing seat width. 38 K None No Power Seat 38 K has plenty of extra legroom due to a missing seat in the row ahead. There is no floor storage during takeoff and landing. The tray table is located in the armrest, making the armrest immovable and slightly reducing seat width. 49 C None No Power Seat 49 C is a standard Economy Class seat, although close proximity to the lavatory, galley, and rear of the plane may be bothersome. 49 H None No Power Seat 49 H is a standard Economy Class seat, although close proximity to the lavatory, galley, and rear of the plane may be bothersome. 50 A None No Power Seat 50 A is located in the last row of the aircraft and may not recline. Proximity to the lavatory and galley may be bothersome. 50 B None No Power Seat 50 B is located in the last row of the aircraft and may not recline. Proximity to the lavatory and galley may be bothersome. 50 C None No Power Seat 50 C is located in the last row of the aircraft and may not recline. Proximity to the lavatory and galley may be bothersome. 50 H None No Power Seat 50 H is located in the last row of the aircraft and may not recline. Proximity to the lavatory and galley may be bothersome. 50 J None No Power Seat 50 J is located in the last row of the aircraft and may not recline. Proximity to the lavatory and galley may be bothersome. 50 K None No Power Seat 50 K is located in the last row of the aircraft and may not recline. Proximity to the lavatory and galley may be bothersome. All Business Class seats are equipped with personal entertainment devices located in the seatback. EVA Air offers a wide variety of food and drink options in both Business and Economy class. EVA Air received its first A321-200 aircraft in Novemeber 2012. This is the first narrow-body jet used by EVA, an airline which previously had only operated wide-body jets. EVA's A321 seats 184 passengers and is configured into two classes of service: Business and Economy. Well, this is a narrow body jet, but EVA has at least made the best of it in terms of space. No issues with the pitch, just note that middle seats have an electronics box, although I don't know why, as there are no individual screens, only audio. Not a great plane for a 5h flight, but there are worse options. TPE-HKG Seat 2A Just as what you would expect from an A321. A fairly new plane, TV screen is crisp but small. Seat recline is good; while I had no problem with the legroom (I'm 5'9"), I would have liked to have a foot rest so as not to feel as if I was slumping. Food was OK but service was excellent, as usual. Perfectly fine for a short haul flight. 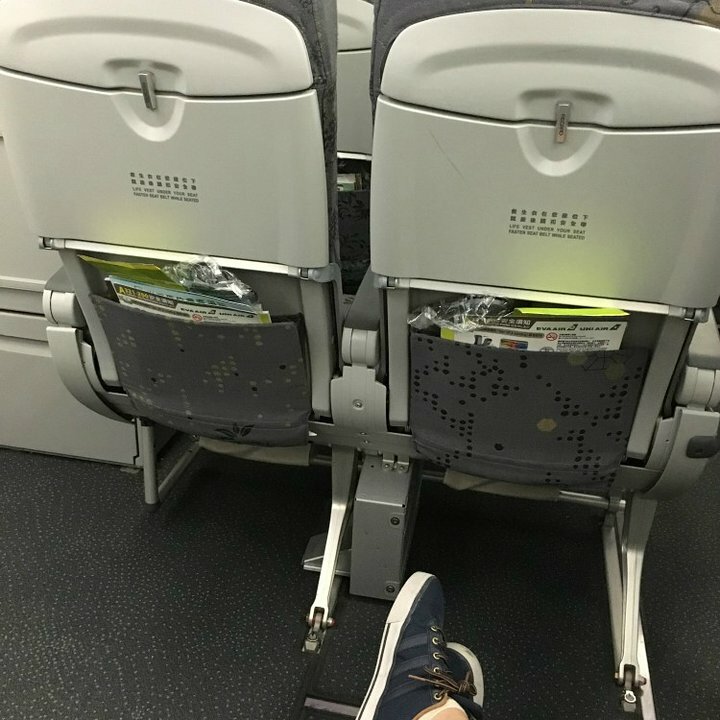 The legroom is very limited! I got the chance to change from the first to the 2nd row and the legroom there is a lot better! Box on floor limits leg room. 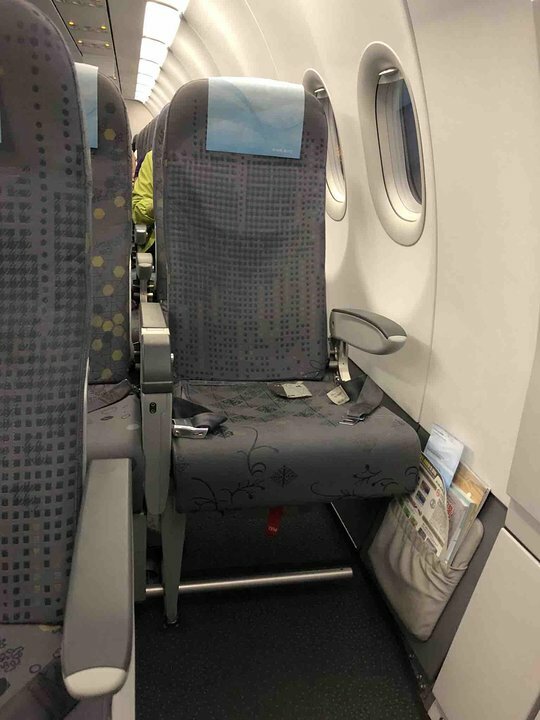 Legroom of seat 20H was inreality restricted and even worse than normal economy seat. I am 183cm high and this seat was very unformfortable and after approx. 4 hours of flight, my legs were so tired. I do not recommend row 20 on Eva's A321. Stuck in a seat with limited recline for 2 hours because of the delay. The seat is so smelly as it is just by the toilet. 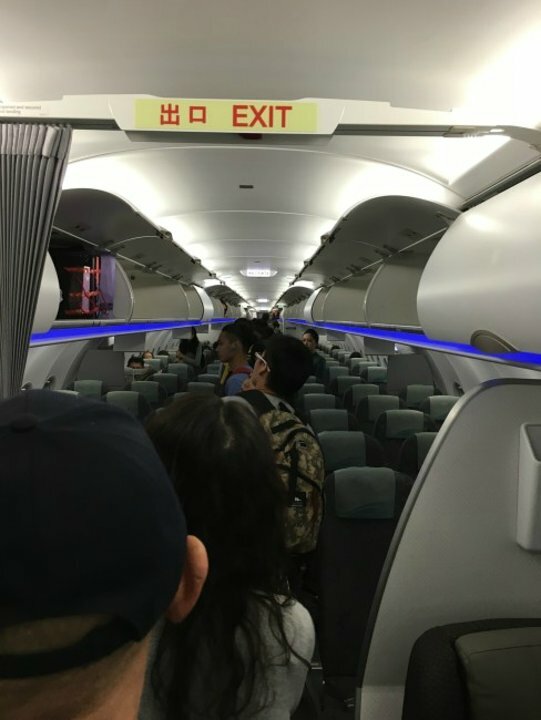 People going to the toilet often bump into row 36( my row). I give 0 marks to EVA Air as this is the worst flight of my life!I will not take EVA Air again! 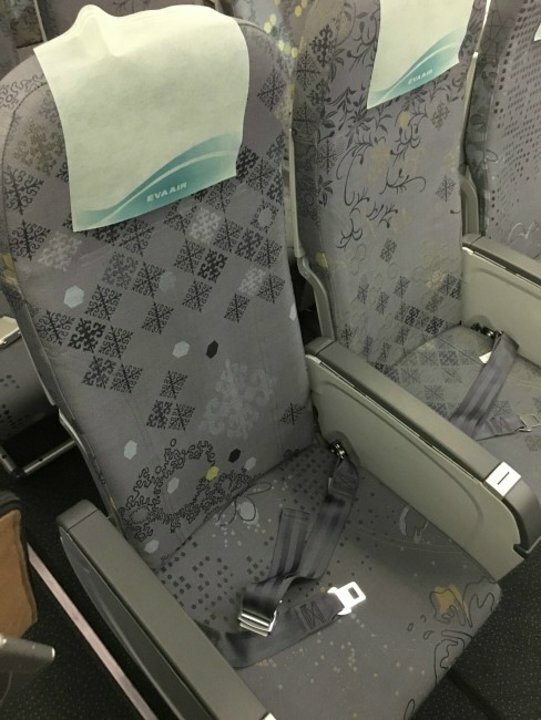 EVA Air flies 1 versions of .